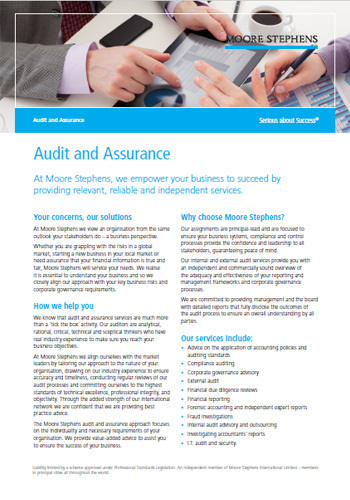 The Moore Stephens audit and assurance approach focuses on the individuality and necessary requirements of your organisation. We provide value-added advice to assist you to ensure the success of your business. Our internal and external audit services provide you with an independent and commercially sound overview of the adequacy and effectiveness of your reporting and management frameworks and corporate governance processes. For more information about our audit and assurance services, download a copy of our brochure by clicking here or reach out to us by clicking here. How will IFRS 15 Revenue from Contracts with Customers affect you? How will IFRS 15 Revenue from Contracts with Customers affect you!